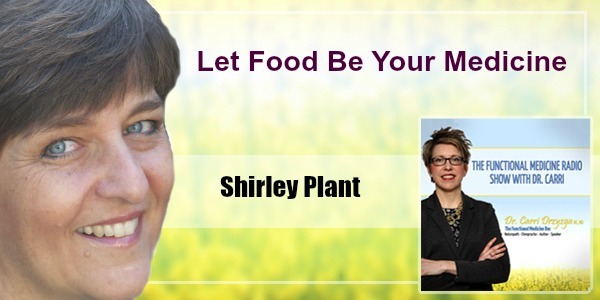 In this episode of The Functional Medicine Radio Show, Dr. Carri’s special guest Shirley Plant explains how to let food be your medicine and the inspiration behind her Eat Real Food Health Summit. Shirley is the author of Finally… Food I Can Eat—an Inspirational Dietary Guide and Cookbook for People Affected by Food Allergies and Intolerances. She is recognized as a menu-planning expert. Shirley has given seminars on food allergies, cooking, and menu planning. As a nutritionist and dietary designer, Shirley offers her clients and their families a rare understanding and unique expertise that few people can match. Her pleasant and caring manner, her own experience as a food-allergy sufferer and her creative design flair helps offer hope for people struggling to find the light at the end of a dark dietary tunnel. How did you come up with the idea of doing a summit? It fundamentally boils down to diet – either you let food be your medicine or your poison, right? What about for the people who think they are doing all of the right things but they still feel crappy? How is that even possible that you can lose weight by sitting on a chair? What are your predictions of the top 3 ideas people will take away from this year’s summit? I had been diagnosed with chronic fatigue syndrome, fibromyalgia, food and environmental allergies, and adrenal fatigue. Mainstream medicine couldn’t help me. I started studying nutrition, the idea of how to let food be your medicine, and changed my diet. It made a huge difference but wasn’t the only piece to the puzzle. What really helped me was changing my diet, embracing and going to see a functional medical specialist – someone that studied energy medicine and the whole mind-body connection because that’s huge when you’re ill for such a long period of time. I started to tune into free webinars and learned so much that as I started to get better, study nutrition, and help people, I felt there was a real need for people to be able to tune in online and hear from these knowledgeable experts that literally span the globe. I knew it was something that I could put together and I reached out to specialists around the world. The next thing I knew I put together 40 speakers and we had this great summit last year! The body is brilliant. It can heal itself – we just need the right tools. You never know, you just might tune into the summit and hear that answer that you’ve been searching for for so long. You want to get to the root problem. Why is this happening to your body? It’s finding a functional medicine doctor that knows which tests we need to have done. The beauty of the summit is that there are so many practitioners on here that you are going to figure it out. We also get people that are really healthy and active but they just want to know how to fuel their active lifestyle. We have those who want to lose weight. At the summit we talk about juicing, how to let food be your medicine, ADD, and how we can change our genes. We can change our genes! We can actually turn them on and off by what we eat, the thoughts we think, the environment we surround ourselves with. A neat talk we have too is about sitting disease. It contributes to many chronic illnesses. We talk about the Core Chair which is the only active sitting chair on the market. There’s everything on the summit. We have giveaways, a chance to win a Vita-Mix juicer. You name it, it’s on the summit. I met with the creator of the Core Chair last year. He’s a kinesiologist. He took 7 years to figure out what chair is best for this. He designed it based on the (exercise) ball but this is very different in that it wobbles but it doesn’t. You can have it as a regular chair. There are no arms and there’s a lower back. So when you sit in this chair, you sit properly. It strengthens and engages your core. The Mayo Clinic did a test on the Core Chair and just by sitting on it you shed calories because you are strengthening your core. You are engaging your body which allows the blood to flow to all parts of your body so that you stay more productive during your day. There’s a setting on the chair that you can move so then it’s like a ball and it wobbles. You can move and move your hips. They have exercises that you can do on it! I do them and I feel great! Some people have a standing desk or a treadmill desk but we always come back to sitting. It’s what we do. So why not be able to engage while you’re sitting? Dr. Carnahan had a personal experience with mold and dives into toxic mold and the symptoms and issues you can have if you’ve been exposed. Proper testing is so important. You can ask your doctor about the Micotoxin Test. It’s just fascinating all the things that can be happening around us that can be affecting our health. Some “healthy” foods can sometimes just not be right for your body. Like Dr. Lyn-Genet Racitas, author of The Plan, says “It’s not the calories, it’s the chemistry of the food”. At the summit we talk about sensitivities and how to determine them with Wendy Myers. Another interesting interview was with Dr. Jonathan Roberti. We talk about vertical gardening. Another amazing speaker is David Gee. If you are a meditator, you’ve heard of him. He used to work with Deepak Chopra. We talk about de-stressifying. Stress is huge! We all know it contributes to so many ailments and issues in our body. If you involve children in planting, growing, and making food, studies show that kids then eat healthier. This year is really going to enforce again how important food and diet are. What we eat can be more powerful than what’s in that pill bottle (let food be your medicine!). It’s simply realizing it then getting the tips and tools you need to make those changes. People will learn how important stress is and the mind-body connection and how powerful that mind-body connection is in healing the body and/or keeping yourself healthy. And for those who are not sick but have a little chronic issue, we’ll go over how to get rid of those and stay well.